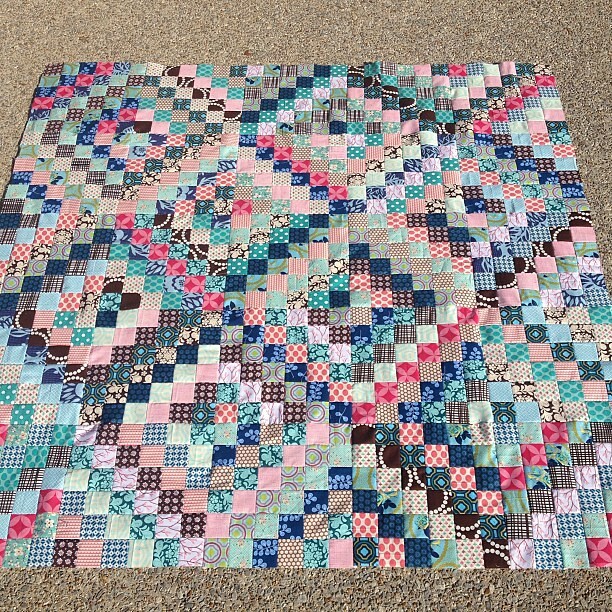 I am way behind on quilting the (rather large) number of quilt tops I have accumulated. I have a good excuse, I swear! I can't tell what it is yet, but it's a really good one! I decided I'd at least baste a few so I'd feel productive. This one is a custom order. 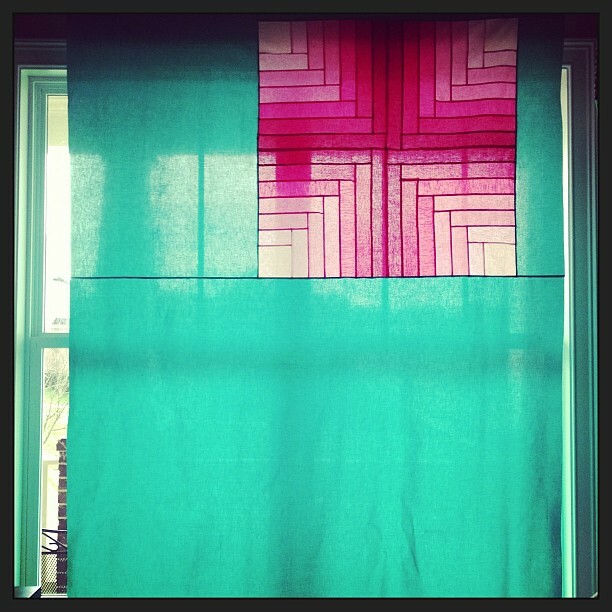 It's a full size replica of a baby quilt I made last year. 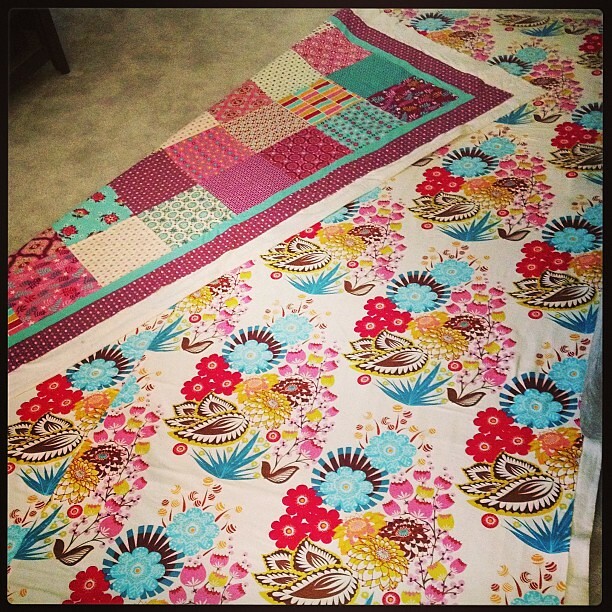 I love Domestic Bliss and that Anna Maria Horner print paired together! This one I just made for fun. I had the idea in my head and I just HAD to make it! Ever feel like that? Here's what the full top looks like. Finally got around to basting my Wonderland quilt too! I so love this line! It was actually harder for me to use the backing fabric that it was to cut into my last two charm packs! I really dig that patchwork print! 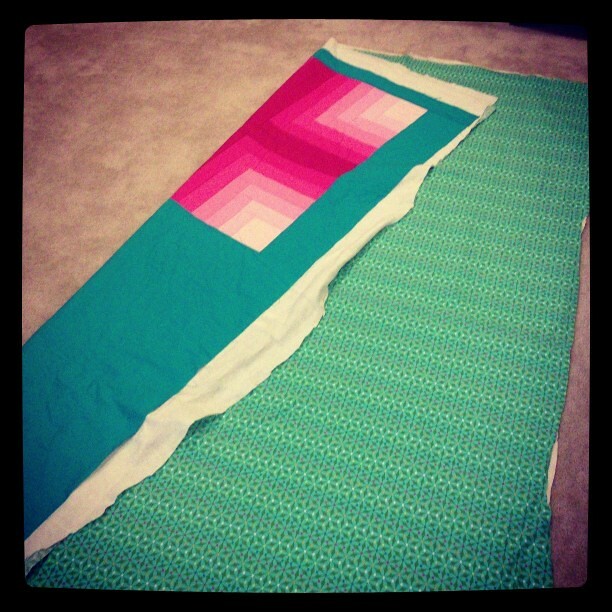 I managed to baste my Scrappy Trip Along quilt too! I started with the backing fabric here and chose the prints for the front basted on that palette. Here's what that one looks like on top. Last but not least, I basted the quilt top I made for my mom months and months ago! Her favorite fabric line is Nest and I managed to get enough FQs to make her a throw. This is the full top view. It was a marathon of basting, though, sadly, I still have a few more quilt tops! For those of you who are curious, I use 505 basting spray which I buy at www.sewforless.com I have a basting video tutorial here. Holy cow, way to use that giant roll o' batting. You must be positively light-headed by now! Great effort! What a wonderful day's work! wow! I am very impressed!! are they headed to your etsy shop? other than your moms? Wow, seriously impressed, I'd have run out of batting and spray after about the 1st one, I'm never prepared enough for this sort of thing! Thank goodness you didn't ask us to pick a favorite! Too much loveliness! How long will the spray basting hold? 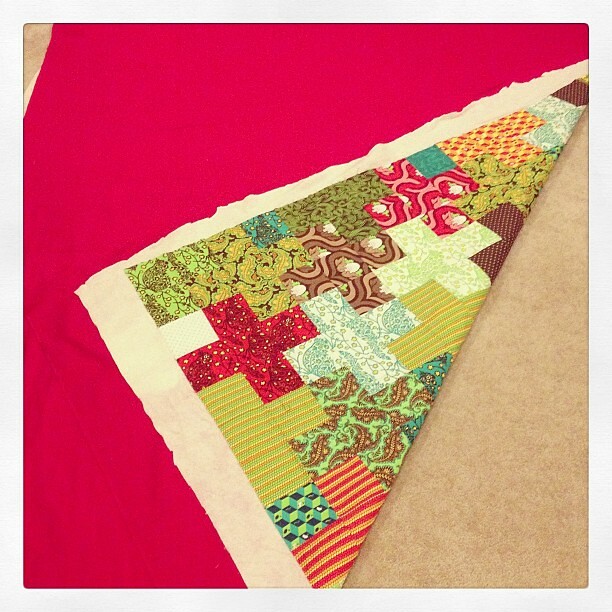 I still pin baste because it can be weeks between doing the basting and finding the time to do the quilting. And I just assumed that the adhesive wouldn't last that long. Please tell me I'm wrong so that I can stop shredding the pads of my fingers on those safety pins! That is a lot of basting! You go girl!! Wow! 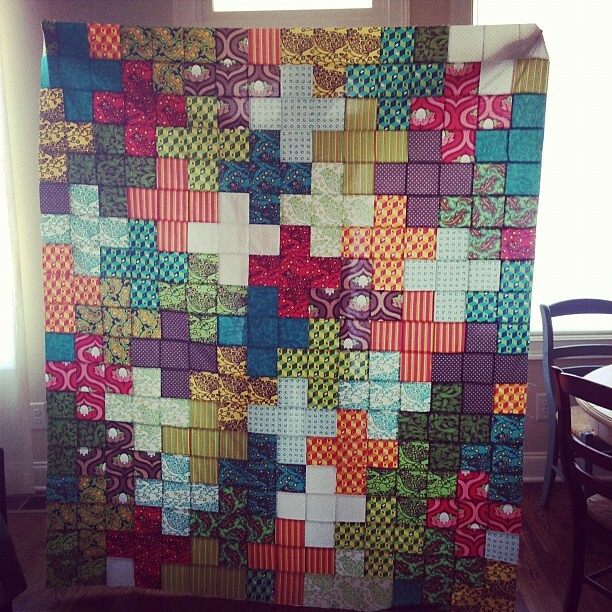 That's a lot of quilts to baste! I'd run out of batting for sure -- not to mention pins. This certainly makes basting spray look good. 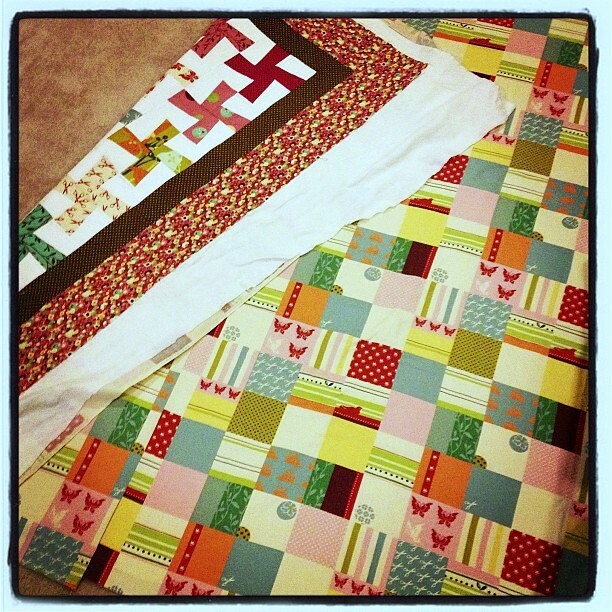 Love all these quilts Kelly! Gorgeous! 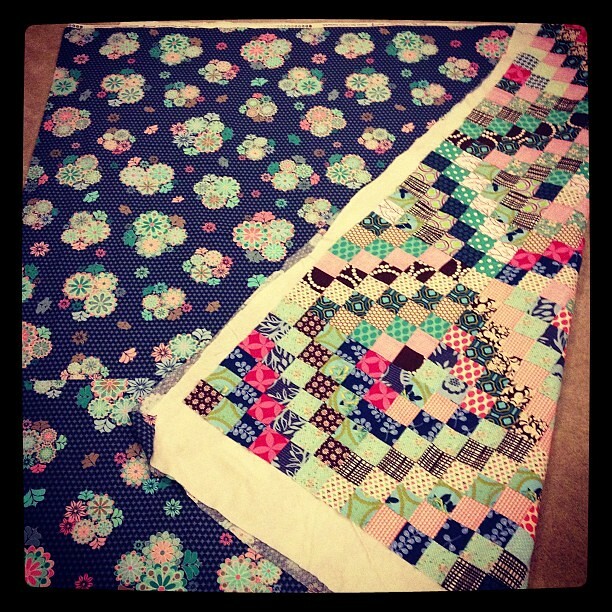 So many lovely quilts - my knees would be sore after doing all that basting! I am seriously impressed. Basting is my least favorite part of the process. I would cut all day and hand-bind all day if I didn't have to put the layer today (and I spray baste). So I am VERY happy you did all of those quilts. Have fun with the rest of it!